SatNOGS project is a complete platform of an Open Source Networked Ground Station. The scope of the project is to create a full stack of open technologies based on open standards , and the construction of a full ground station as a showcase of the stack. 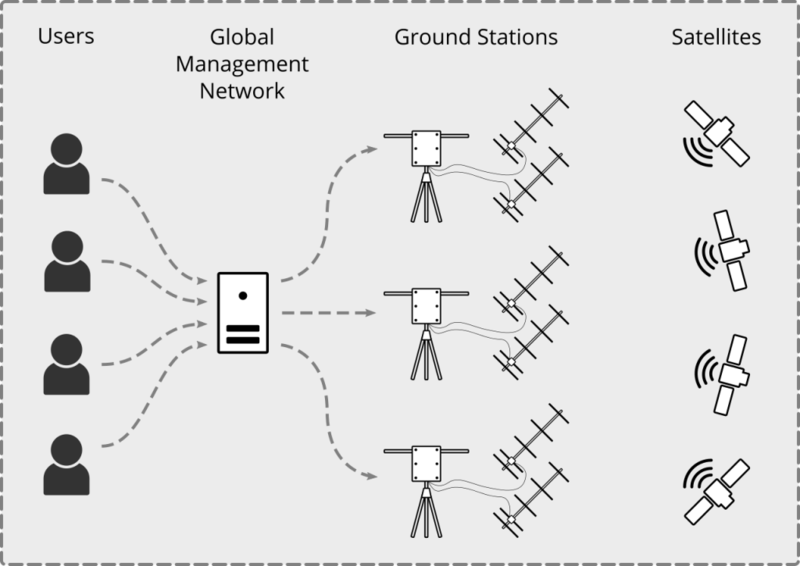 There are a number of elements to the project that integrate hardware and software in a way that allows multiple observers to be connected to multiple ground stations so that tracking and monitoring satellites from multiple locations is possible. The data that is collected is publically available through the production environment. A user is any validated member of the SatNOGS system. All you need is to sign up and with a bit of familiarity you will be able to use the system. SatNOGS Network – Our observations, scheduling and discovery server. SatNOGS Network is a web application for scheduling observations across the network of ground stations. It facilitates the coordination of satellite signal observations, and scheduling such observations among the satellite ground-stations connected on the network. SatNOGS Client – An embedded system that receives the scheduled operation from Network, records an observation and sends it back. SatNOGS Client is the software to run on ground stations, usually on embedded systems, that receives the scheduled observations from the Network, receives the satellite transmission and sends it back to the Network web app. SatNOGS Ground Station – The actual ground station instrumentation with tracker, antennas, LNAs and connected to Client. SatNOGS Ground Station is an open source hardware ground station instrumentation with a rotator, antennas, electronics and connected to the Client. It is based on 3D printed components and readily available materials. Simply any satellite in the SatNOGS Database. This is a growing record of educational, amateur and commercial satellites commonly referred to as the DB. SatNOGS DB – Our crowd-sourced suggestions transponder info website. SatNOGS Database is a crowd-sourced application allowing its users to suggest satellite transmitter information for currently active satellites. Its data are available via an API or via a web application interface, allowing other project to use its satellite transmitter information. Dan White presented "Overview of the Satellite Networked Open Ground Stations (SatNOGS) Project" at 32rd SmallSat conference 2018. Nikos Roussos presented "SatNOGS: Crowd-sourced satellite operations Satellite Open Source Ground Station Network" at FOSDEM 2018. Pierros Pappadeas presented "Going to space the Libre way" at the AmSAT UK RSGB 2017 convention. Scott Bragg presented "Decoding Satellites with SatNOGS" at linux.conf.au in 2017. Manolis Surligas presented "SatNOGS: An SDR-based Satellite Networked Open Ground Station" at FOSDEM 2017. Dan White presented "SatNOGS: Satelllite Networked Ground Stations" at the Digital Communications Conference in 2015. This page was last edited on 14 April 2019, at 19:28.